Your theme works with WPML to create a fully multilingual website. This means you can have your website available in multiple languages. Getting set up with WPML requires a very specific configuration which is outlined below. 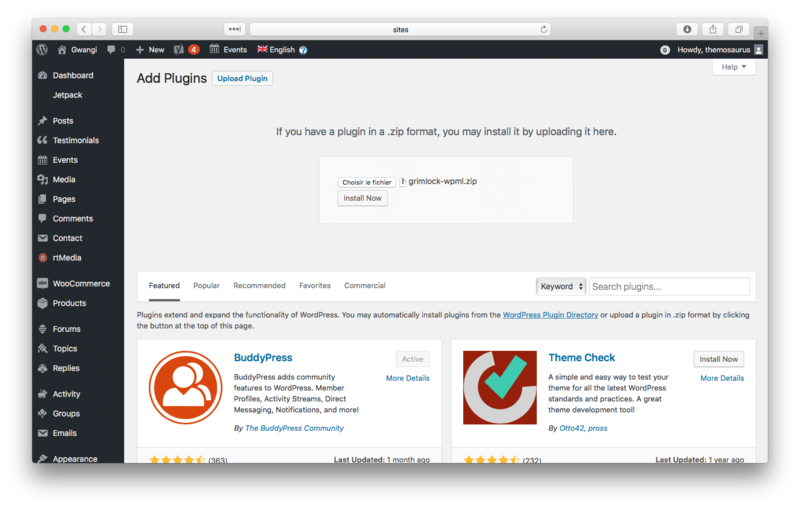 To install the downloaded plugins, go to Plugins > Add New and then, click on the Upload Plugin button. Once you have selected the .zip file containing the plugin, you can click the Install Now button. Once installed, click the Activate Plugin to enable WPML. Repeat this process for each downloaded plugin. The WPML wizard will guide you to properly configure the multilingual site. Just click the Configure WPML button to get started and follow the suggested process. Finally, to end the configuration step, you will be asked to enter your registration key. 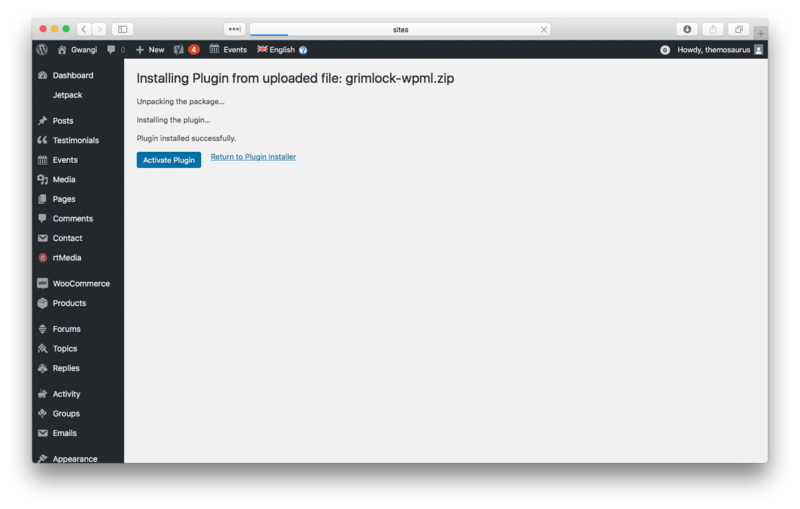 No WPML plugin will work until this step has been completed. Congratulations! WPML is now active and set. Heads Up! Translate Your Theme First! Every time your website language changes, WordPress will load a new translation file for your theme. Before starting to create a multilingual website with WPML, make sure you have translated your theme in every language required. The majority of strings displayed on your website can be translated using a translation file, whether they come from a plugin or the theme. However, some might need a change and can be translated using the String Translation tool. 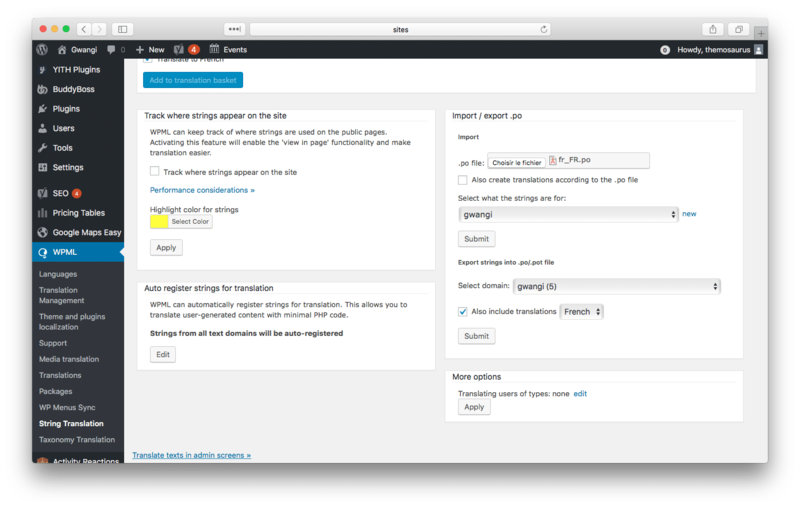 It allows you also to translate theme options such as the strings entered through the Customizer. You can still import translation files event after the WPML setup. Just navigate to WPML > String Translation and look for the Import / export .po pane. Finally, depending on which plugins are installed on your server, you might need extra WPML add-ons to make your website truly multilingual. For instance, BuddyPress requires BuddyPress Multilingual and WooCommerce requires WooCommerce Multilingual to help you translate their content in another language.